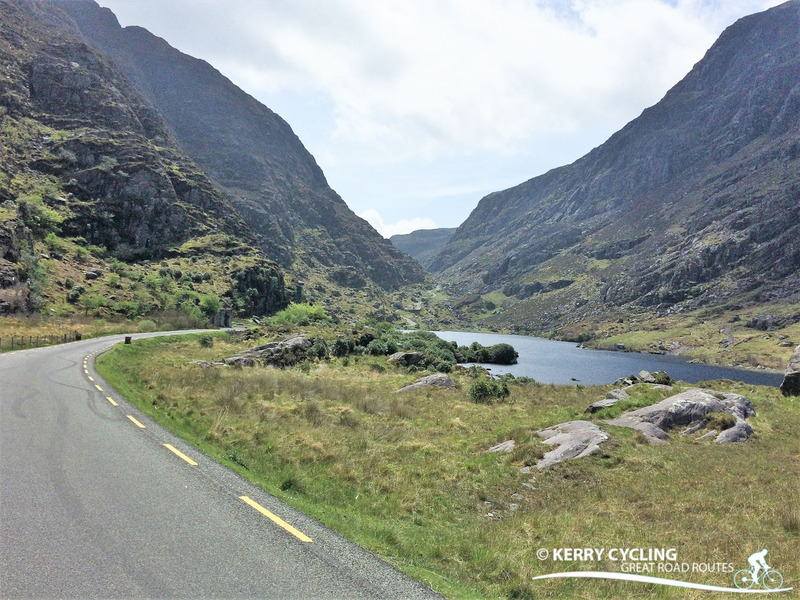 The Gap of Dunloe and the Black Valley are among the most renowned areas for tourists in Kerry and with good reason. The glacial landscape appears timeless and for the most part untouched by modern life. 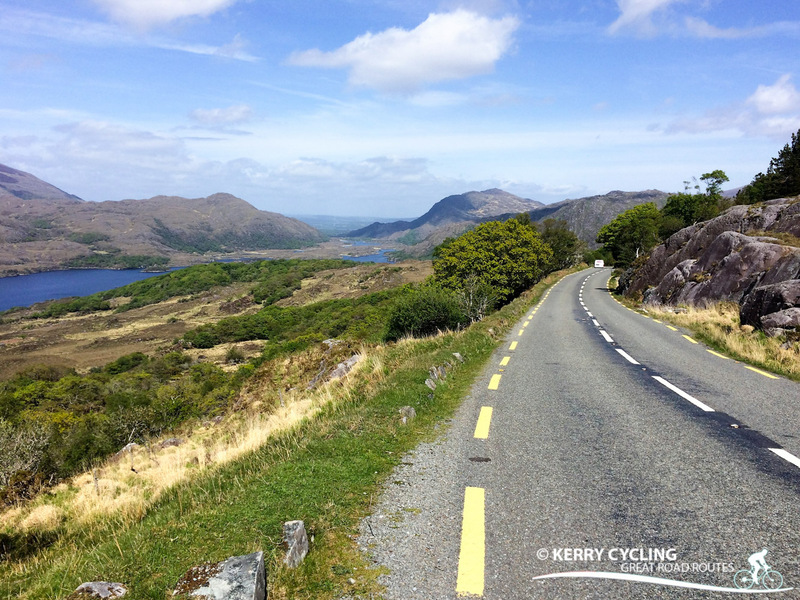 The majority of the route is on quiet roads with little traffic and ample opportunity to soak up the surrounds, including views of Lakes of Killarney, the MacGillycuddy’s Reeks, Purple Mountain, Ladies View and Muckross Park. The Gap of Dunloe is popular with tourists and can be busy with Horse and Carriage Tours beginning from Kate Kearney’s Cottage and onwards. The descent From Moll’s Gap down to Muckross is on a windy narrow road and it’s too easy to get distracted by the scenery ahead so be sure to take care. You leave Killarney on the start of the Ring of Kerry route (N 72), travelling towards Killorglin. This section is flat and aided by some bicycle paths. At approx 7 km take “the Gap Rd” sign posted Gap of Dunloe. Here you are taken onto a narrower country road. Keep following the signs until you reach Kate Kearney’s. On leaving the cafes and souvenir shops of Kate Kearneys you start a gradual climb. Along this section of the route the road can get quite rough (especially in the centre) due to the Jarvy horses. Along this section horse and traps, walkers and cyclists are King. 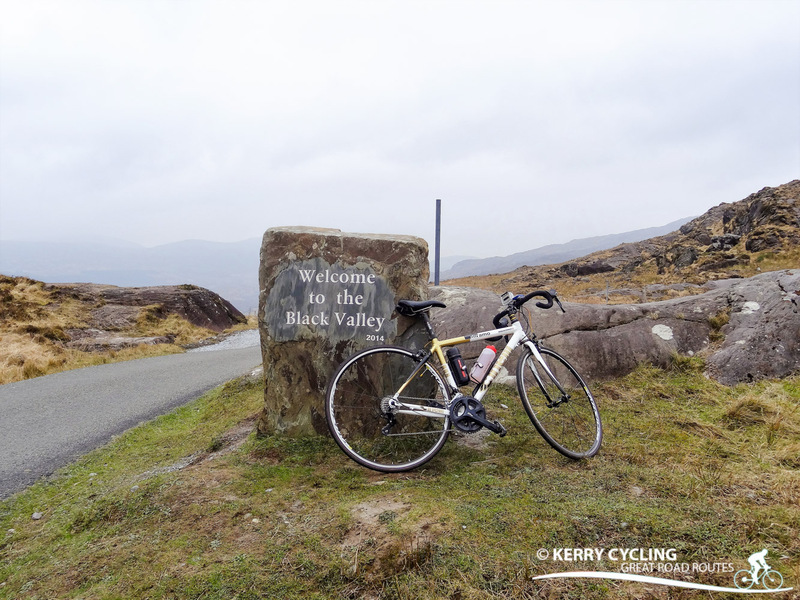 Absorb and enjoy the stunning Black, Cushvalley and Augher lakes, before a series of hair pin bends see’s you safely up to the top of the Gap of Dunloe. The majority of this section of the cycle ride takes you through the Black Valley. Things start off very scenic with fantastic views of the whole Black Valley and it’s surrounding mountains from the top of the Gap. The descent into the Black Valley is a series of hair-pin bends bringing you past an old country church and hostel. Once the route flattens out you have probably face into the worst section of road for a good 5 km. The bad surface though is well compensated for the fantastic peace and tranquillity of the area, where silence is golden, bar for the gurgling of streams, the rush from waterfalls and the sound of the gentle head wind. The road does finally improve though staying charmingly narrow. You’re exit out of the Black Valley comes at about 30 km with a 3 km climb to Molls Gap. The climb looks far worse than it actually is, with a few Alp style switch backs taking away the worst of the gradients. 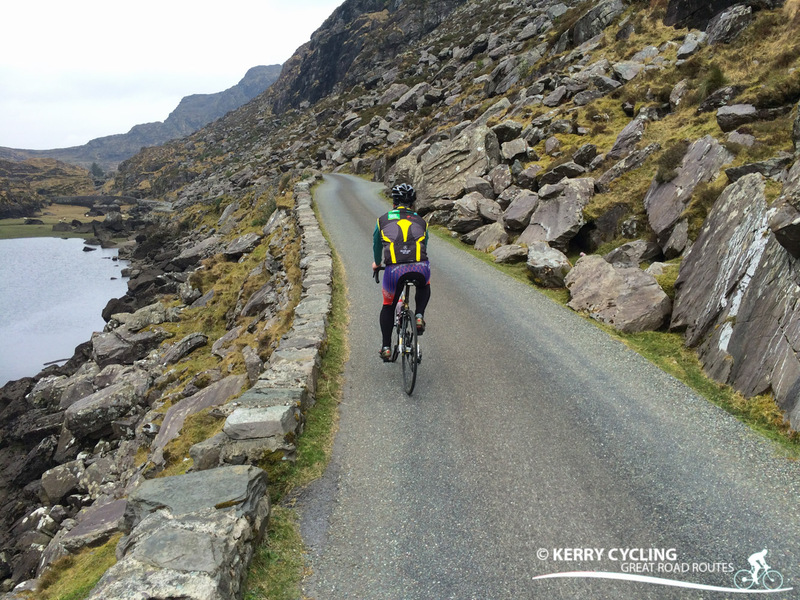 On reaching the top and the main road, take a left for a well deserved free wheel down into Molls Gap. Once at Molls Gap there’s the option for refreshments and meeting up with the World and his wife again. From now on you are on the N 71 (Ring of Kerry route) to Killarney. Here there is a vast improvement in the road surface, as it widens and becomes smooth and slick. The terrain is mostly downhill, with the odd sneaky hill. Ladies View is another spot to re-fuel and enjoy breath taking views. Once leaving here though you have a pulsating downhill ride. With plenty of bends, a narrow bridge and a small tunnel to negociate. Here you are in the thick of the Killarney National Park, with it’s lakes and rugged views. You might even see some deer or an eagle! The terrain and road surface becomes slightly rolling, with a lifeless road surface. Things do improve around the Torc Waterfall area, with a more lively surface once more. Along this section there are a few options to stop off at Torc or swing into the left and visit parts of the Muckross estate. From Muckross the centre of Killarney is less than 6 km away.